Feline Panleukopenia is a highly contagious disease caused by infection with Feline Parvovirus (FPV). Canine Parvovirus (CPV-2) arose from Feline Parvovirus through a series of mutations. 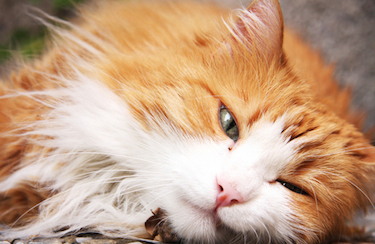 CPV-2 has the ability to infect and cause disease in cats. FPV can infect dogs, but does not cause illness and is not actively shed from infected dogs. FPV is transmitted when a cat either directly eats the feces of an infected cat (i.e., grooming) or from the bedding, litter pans, food bowls, clothing, etc. of an infected cat. It can survive in the environment for more than a year, and is resistant to ordinary household disinfectants. It can be destroyed with a bleach solution (diluted with water at 1:32). Panleukopenia Virus is present wherever there are susceptible animals. Mink, ferrets, raccoons, and wild cats all serve as a source in addition to other cats. Signs of the virus can include loss of appetite, depression, vomiting and diarrhea in the early stages. Later stages may include crouching in pain with the cat’s head hanging over a water bowl. With pain in the abdomen, the cat may cry plaintively. If able to drink, vomiting occurs immediately afterward. Kittens with in utero or neonatal infection can show neurologic signs. The virus often leads to “fading kitten” syndrome and death. A simple blood test can diagnose the virus, and detecting it early in the course of the illness is critical. Intensive supportive treatment must be started immediately to save the cat’s life. Cats who survive may be immune to reinfection, but can shed the virus for several weeks. If you suspect your cat may be ill with this virus, it is much better to be tested than to wait until desperately ill and to test the odds of survival. The good news is that the vaccine against FPV is very effective. The American Association of Feline Practitioners recommends vaccination of kittens beginning at 6 weeks of age, and repeating vaccines every 3-4 weeks until 16 weeks of age. Cats are then vaccinated one year later, and every 3 years thereafter. With the help of our vendors, we are now able to offer you the THREE-YEAR DISTEMPER VACCINE at a rate of $39.49. If your cat is not currently vaccinated with the Feline Distemper Vaccine (FEV), please call our office and schedule an appointment immediately.